Finding the right property in our budget was a challenge, but we did it. (Read more about that in part 2.) House placement and access presented some more challenges, but we finally broke ground in October 2004. Just about everything that could happen to slow things down, did, but we are finally nearing completion. Hopefully by the end of May or early June we will be moving into our new home. The house is all ICF (Insulated Concrete Forms) from top to bottom. Now that the windows are in place and it is sealed and insulated, I can honestly say that there are very few houses I have been in that feel as secure. The wind can do its worst outside and you would never know once you’re snugly inside. Even the bonus room above the garage is amazingly well insulated. It is stick built, not ICF, but it was thoroughly spray foamed plus either fiberglass batting insulated or blown in cellulose insulated on every exterior surface. It has a wonderfully solid feel. Read more about ICF Construction in “ICF Construction – What You Need to Know About an ICF Home” . I also found out that used solar panels are allowed to qualify for Focus on Energy rebates, so we are planning to ground mount some used collectors I had in storage and use them for both space and water heating. We will do as much of the work as we can ourselves, but the tie in the conventional system will require some controls and plumbing beyond my level of expertise. I have been convinced by my husband and the HVAC contractor to include ducting adequate for forced air and thus air conditioning and forced air heat, should the in floor heating tubes ever explode and cease to function. 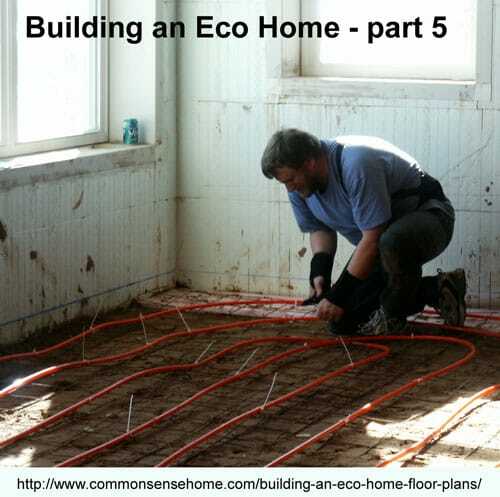 It’s much easier (and less costly) to do it now than to retrofit after the house is completed. I still don’t think will have much need for AC and the heating loads should be modest, too, but I feel safest planning for the worst and hoping it will never happen. 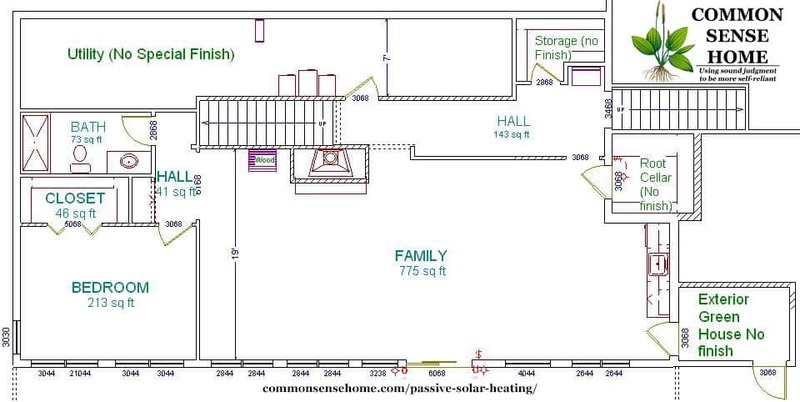 We plan to take full advantage of passive heating and cooling and see how the house behaves. There will be spot ventilation with timers in the bathrooms, the super quiet and highly efficient Panasonic exhaust fans, and a lovely Fantech heat recovery ventilator with controls donated by Energy Federation Incorporated (www.efi.org). The masonry stove kit with bake oven option should be arriving from TempCast (www.tempcast.com) any day. The chimney is up and looking good (it stands independent of the stove itself). I can almost taste the fire baked breads and pizzas right now. The last of the plumbing fixtures have been selected and the ADA tub and shower are in place. The Toto toilets with the best flush in the business and the water-saving urinal will be following soon. Our Filtrol laundry filter has arrived, and there’s a special drain hole to allow laundry greywater capture and reuse. We still need to rig up the rain barrels, but that can’t be done until final grading is complete. I am in love with my root cellar. It’s my favorite unusual feature at this point (other than the ICF walls). We still need to install the ventilation pipes to promote proper cross ventilation and build the shelving for food storage, but the space (under our front porch) is great and holds a cool temperature really well. A wonderful reference book is Root Cellaring: The Simple No-Processing Way to Store Fruits and Vegetables by Mike and Nancy Bubel. While we were working out at the house during the near 80 degree days in early April, we placed our beverages and lunch in the cellar to keep cool. The temperature in the house crept up during the course of the day, but the root cellar stayed nicely chilled the entire time. It’s the least expensive to operate refrigerator I’ve ever owned. Another feature I’m really looking forward to is our “green” cabinetry designed by Paul Yeager of Cosmic Walker cabinetry (www.cosmicwalker.com). Paul has been a gem to work with, and his work compares favorably with other custom cabinet makers we considered. However, Paul provides one option they don’t – his cabinets are designed with the environment in mind. Through the use of biocomposites, sustainably harvested hardwoods, and environmentally friendly finishes, Cosmic Walker cabinetry blends artistry with sustainability. In addition to his inherent understanding of form and function, Paul has also recently purchased a new software program and laptop that will allow him to design, estimate and provide a 3-D preview of projects on site. I have been very impressed by his unique combination of professional artistry, commitment to the environment, and interest in learning new technology. It’s a mix you don’t find very often, and one I greatly appreciate. He also does feng shui consultations, the art of which has recently undergone significant growth as people seek balance and positive energy in their lives. Many days have been spent putting “sweat equity” into the house. The tubing was the biggest project, but we also had to move a section of the laundry room wall when we figured out (just prior to the drywall being installed) that the upright freezer would not fit in the room (well, it fit, but the door wouldn’t open). The wall was very solid – it actually took more time to demolish it than to rebuild it. Luckily, we were able to steal some space from the pantry and the freezer will now fit and the door does open. We also did some wiring, put a catwalk in the attic, covered the basement floor with paper to protect it for the concrete staining, put backing in the walls for handrails, and a handful of other projects. There is still much to be done, including building the deck, landscaping/planting, finishing the root cellar and greenhouse and much more, but we look forward to the experience. 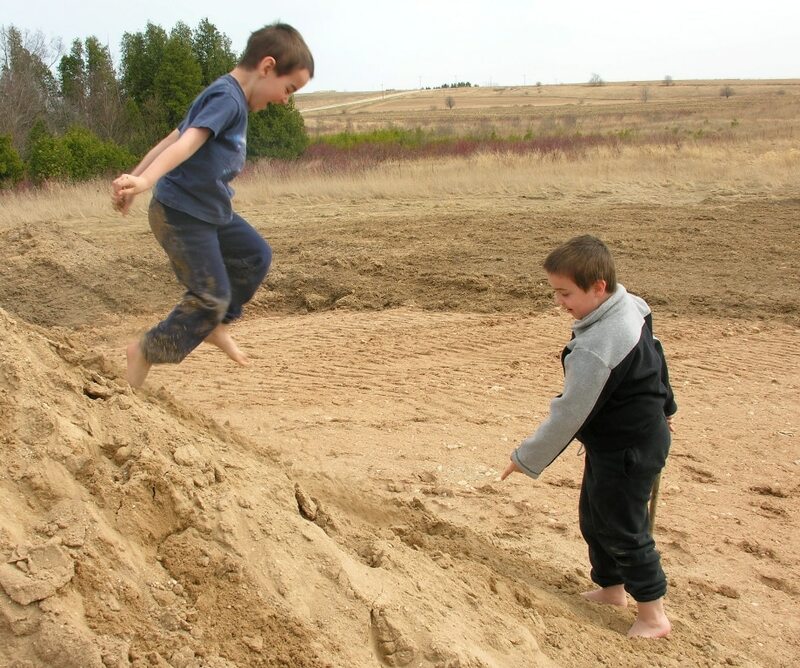 The boys have started putting down their roots, too – bodysurfing down the dirt piles, investigating the flora and fauna, playing hide and seek and finding favorite niches – it is our hope that they will grow and flourish in the rich environment. Right now we are considering once again opening our home to an exchange student from Spain for the summer to add a little more spice to the mix. We hope that sharing our adventure will inspire others to pursue their dreams as well. Below are blueprints of the house, upper and lower floors, that my husband made in 3-D Home. Only minor changes were made from these prints. Click on either drawing to enlarge. 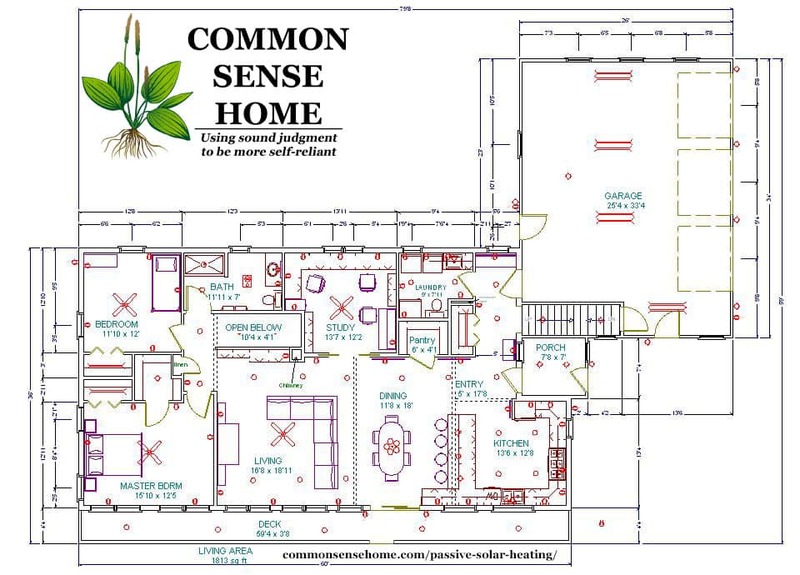 We have the radiant in floor heating in our house which we are living in and building at the same time. I think you are wise to put the ducting in as well. My issue with our place is that the air is dry and I am constantly shocked through the winter when I touch anything or anyone. We will be installing venting and a whole house filter and whatever else necessary to combat that. Looking forward to folowing your posts on the building of your house!